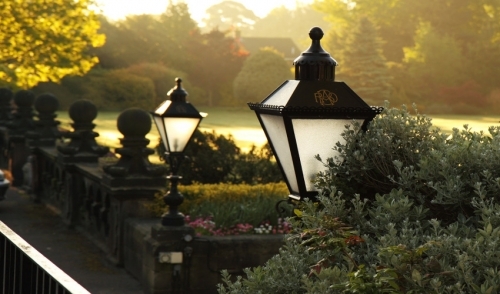 The installation of landscape lighting in your outdoor spaces starts with thoughtful planning and vision. The best part about lighting is that a little can go a long way. A simple lamp at the corner of your driveway can illuminate a large area. Follow this article for information about different lighting options and tips on how to install them. Landscape lighting installation starts with a plan of how you wish to illuminate your home and the lights you will use to do it. There are two ways to power your outdoor lighting: solar and low-voltage. For the green consumer, solar is a perfect option as it’s easy to install and has no wiring. The lights are powered by the sun saving the planet and your wallet some ache. Low voltage lights require more ‘installation’ and are connected to any outdoor GCFI outlet. These lights are powered by a step-down transformer hence their name ‘low voltage’ and use one-tenth the power of a 120-volt system which requires more power and are tough to install. Higher wattage systems will also create harsher light without improving the aesthetics or increasing the safety around your home. A good tip to remember is that when it comes to lighting it’s not all about the power of the lights. Low voltage or solar; each can achieve a positive outcome for your outdoor space. Outdoor light goes beyond just picking out the best lights in the hardware store, it’s about the artistry and creativity of developing an attractive lighting scheme. Before you start the excavation to install the lights, always check for underground utilities. Once you have the clearance for all the areas you wish to plant a light, find the proper GFCI outlet around your home. Set your low-voltage power pack near the outlet, and assemble your lights together. For solar systems, set up your fixtures and double check the panels are in place properly. Once everything is ready to go out, start placing your lights in their final positions. This is a great opportunity to review your plan to make sure you’re illuminating all the right spots. Driveways, entries, decks or patios, gazebos, and architectural features such as fountains and sculptures are all great areas to light up. Try to avoid light pollution as much as possible. Light pollution is the number one reason why outdoor lighting can look bad and is often a result of using too many lights or poor installation. Light pollution can affect the inside of your home, wash out the stars, blind people upon approach, and is a waste of energy. After the lights are placed, lay out the cables and connect each to a connector. Dig small trenches to cover the cables and push each light halfway into the ground. Following the connection of all the lights go back to the outlet and connect the cables to the power and turn it on. Check for uniform brightness and take one final look at your lights. If you like what you see, finish the install by securing the lights and closing the trenches. Feel free to use accessories such as sensors, timers, and light shields to aid in your installation. These will all help you better control the light and reduce any pollution. Visit your local hardware store and use the tips in this article to create a beautiful facade and illuminate your outdoor spaces.